Krish Group today occupies a prestigious position in real estate industry for construction of high quality residential complexes and commercial & shopping centers in Bhiwadi NCR. Krish Group is well known for their innovative designs, well-planned amenities and timely completion of projects. It is the group’s distinct philosophy, vision and core values that differentiate it from other development groups. The Group’s financial standing is very strong boasting of its Zero (0) Debt capital structure. The Group is a member of the Bhiwadi Chapter of CREDAI (Confederation of Real Estate Developers Association of India) which is the apex body of real estate developers all over India and having 8800 developers enrolled with it. It is indeed a great pleasure to welcome you to Krish Group’s corporate website. I want to thank you for giving us the opportunity to describe the valuable services Krish Group has to offer. We pride ourselves on strictly adhering to a set of core values that has enabled us to develop and manage exceptional properties and build strong, long-standing relationships with our clients and partners. 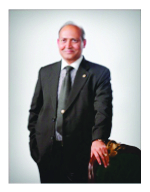 Since entering the real estate business in 2006, Krish Group has changed a great deal. Krish Group has excelled in the field of Real Estate by supplying homes to all segments of society where the demand for homes is ever increasing. Being a company from the region, our presence is strongly felt in NCR. We arrived where we are today by placing our clients’ needs first. Their satisfaction is our success, and our commitment to fulfill their needs reaches through all levels of our organization. We create value as opposed to generating fees. We maintain ownership rather than positioning a project for short-term sale. We don’t just believe in a commitment to excellence—we practice it every day. Whether you are an owner or investor, I can personally attest that your association with Krish will be handled with the utmost respect and will be mutually beneficial. Our website is designed to offer opportunities, satisfy specific requirements and answer any questions you may have. Additional information can be made available by simply writing to us at customersupport@krishvatika.com or by contacting a member of our team personally. The promoters of the Group have their feet firmly entrenched in Rajasthan. The promoters have diverse business expertise and experience, which they are bringing to nurture the group. Their proven leadership in Real Estate, Trading, Financial Management and Consultancy has enriched the value and ethics into the Krish Group. In other words, the promoters of the group are experienced in hatching golden eggs since decades. The promoters have entered in the real estate industry as a part of diversification and expansion plans. Therefore, the group has a planned vision of growth and development. 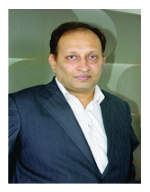 Having an experience of over 30 years in the field of finance and accountancy, CA S.K. Singhal has provided his consultancy services to about 150 odd projects ranging in the fields of Furnaces, Rolling Mills, Pharmaceuticals, Real Estate Automobiles, Cycles, Foot wears, Chemicals etc. and raised them from scratch to top notches. Mr. Singhal has been a part of all the major developments, be it development of infrastructure, promotion of industries, or the social development that have taken place in Bhiwadi over the past many years. With such a wide knowledge and experience, Mr. Singhal has been the guiding force to all the business decisions and policies of the Group. After mastering the trade of cement and steel and providing sturdy foundations to more than a thousand industries, Mr. Agarwal has earned a wonderful reputation to deliver quality and cost-effective materials to build strong and durable infrastructures to almost all the big shots of the NCR region. Through his dedicated and dynamic leadership, Mr. Agarwal has steered the Group through all the tough times to a respectable and commendable position where the Group stands today. His hard work and detailed workings have given the group a strong foundation. Being a Civil Engineer by qualification, Mr. Ashok Agarwal keeps a close and vigil track of the Construction and civil side of the Group, which is the very essence of any Real Estate Company. Krish Group is known for its quality construction and wonderful livable spaces. This benchmark became easily achievable due to the guidance and support provided by Mr. Ashok Agarwal. Another Civil Engineer on the board, Mr. Ajay Agarwal being an expert in handling purchases keeps a constant track on the procurement and just in time supply of the two basic/ main ingredients in construction sector that are cement and steel. Keeping a regular check at the best quality available in the market at the most competitive prices, Mr. Agarwal helps the organization to provide affordable housing options in such a tough and competitive market. 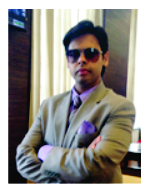 Having completed his professional degree at a very early age, CA Rajat Singhal, son of Mr. S.K. 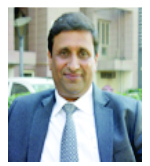 Singhal, joined the Group to provide a stint of youth and dynamism to the Group. Bhiwadi is modernizing fast and has all the lifestyle facilities of a city. The town is spread over nearly 5,300 acres and around 3000 big, medium and small scale industries. They include industries like steel, glass, furnace, electronics, engineering, automobiles, textiles, pharmaceuticals, printing, cables, rolling mills, food processing, herbal care units, etc. Bhiwadi is only a few kilometers away from Manesar, an emerging industrial and real estate hub adjoining Gurgaon, which has brought the attention of investors and buyers on this bustling township. When compared to other areas of the NCR, the prices in Bhiwadi are quite reasonable. “As Bhiwadi is on the highway and its infrastructure is improving by leaps and bounds, it is emerging as a place for people who cannot afford homes in Delhi or Gurgaon. Although it is 70km from Delhi, it does not take too long to traverse either way owing to the excellent connectivity it has with the national capital. 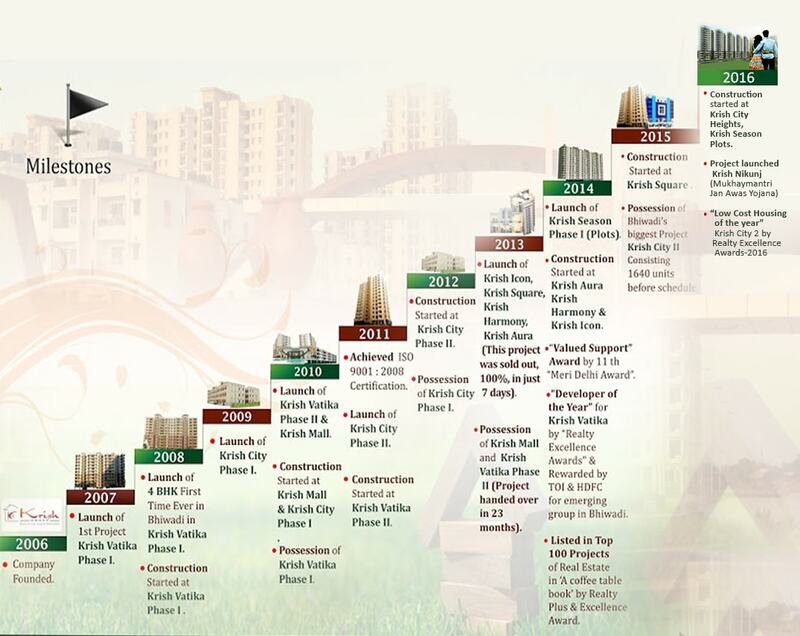 Bhiwadi is a typical Tier II city and gives value for money to the investors and the buyers alike. Newly-constructed apartments here are generating a lot of buzz, as they offer multiple options to the middle class people. It offers better facilities at a much more affordable price to the middle income group people in comparison to Gurgaon, Noida, Faridabad, etc. “A big advantage to Bhiwadi, and for that matter places on or near NH-8, is the ease of connectivity. The place has attracted a lot of industrial activity and provided scope for a boom in real estate. Another plus point of Bhiwadi is its flawless water-supply system. When compared to Gurgaon, the prices are very reasonable in Bhiwadi. The rapid industrial growth coupled with good connectivity has made this place very attractive to people interested in real estate. With affordable prices, well within the reach of the middle class, Bhiwadi will give good returns in the long term. The expected arrival of DMIC and Rapid Rail too will boost the real estate market in Bhiwadi and Manesar, and thus provide good appreciation. As people start moving into these companies the need to have house near their place of work will become imperative, which will also help in boosting the rental values. Industrialists from Delhi, Punjab and other parts of India have set up base here. The Rajasthan Housing Board has been active in the industrial town. The area has all basic amenities like piped water, schools, transportation, hospitals, industrial gas pipe line, telecom networks, banks, etc. The expansion of the Honda factory has seen an increase in its workforce from 1,000 employees to 7,000 employees, which has prompted developers to create more housing in this area. Toyota, too, is planning to set up a plant in the same location and the announcement has led to another boom. Apart from business and manufacturing the infrastructure available here is also up to the standard of big city. Bhiwadi is well connected with NH-8 (Delhi-Jaipur Highway ), SH-25 ( Alwar-Bhiwadi Road ) and NH71B. Rewari Railway Junction is only 20 minutes away, while it takes only 1 hour to Domestic and International Airport of Delhi. All in all well-connected township of Bhiwadi keeps you in touch with the world without the hustle-bustle of a metro city. Bhiwadi can boast ample facilities and civil amenities. A fairly good number of health care facilities which includes Private Clinics & Hospitals / Nursing Home & Govt. Hospitals are available. Shopping Complexs and Malls are also adequate & growing. Classic Golf Course, Wet & Wild Resort, Country Club Resort and Heritage Village are in proximity too. The reputed Rotary and Lions club too are present in the city. Some well organized educational institution like G D Goenka, Suraj School, R P S School, Modern Public School, St. Xavier School, Starex International, DPS Rewari are to name a few. Almost all premier Banks like HDFC, ICICI, SBI, SBBJ, PNB, OBC, BOB, Yes Bank, etc. have their branches in Bhiwadi. Fortune Park Orange, Country Inn & Suites, Golden Tulip, Park Inn by Radisson to name a few Hotels, restaurants and other recreational facilities are available here. To achieve the highest possible standards of the real estate industry while establishing our company as the preferred real estate company amongst various markets both domestic & foreign. To be a world class company in developing ideal investment opportunities and innovative real estate solutions, both locally and globally, that exceeds our clients’ expectations. To satisfy every customer need by providing them quality construction, on time possession and fulfilling our commitment. To continually explore new ideas and technology, to make construction more cost and time effective. To develop and operate exceptional housing and commercial, be competitive and well positioned today and tomorrow. To contribute maximum in achieving Modi Government’s Mission 2022 of ‘Housing for all’. Commitment: Committed in heart and mind to deliver. We work hard with sustained effort and always look forward to achieving the highest levels of excellence. We are keen to provide the best standards of service to ensure our customers’ satisfaction. Constant improvement, innovation and growth, celebration of individual success, respect for each individual and working for mutual opportunities and fulfillment are our core values that distinguish us from others. To be the company that best understands and satisfies the product, service and self-fulfillment needs of the investor/end user. We as a business are dedicated to serve our customers through an “open and honest” approach. We always respond to the customer with promptness, sensitivity, respect and integrity. 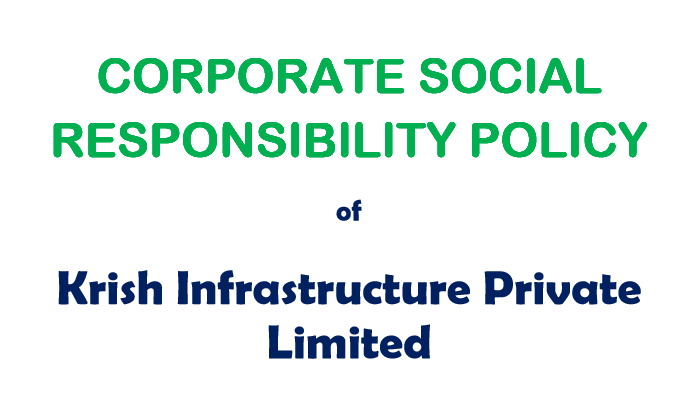 CSR Policy Krish Infrastructure Pvt. 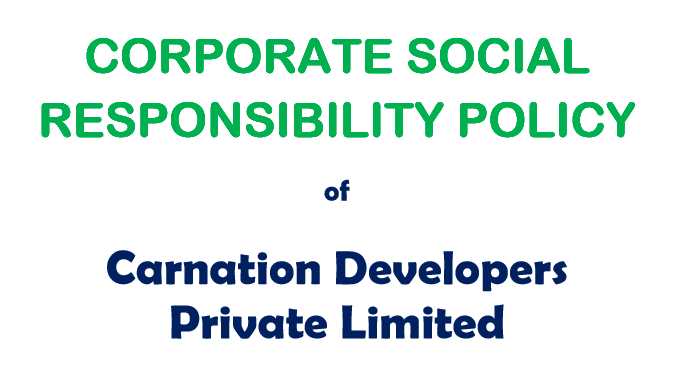 Ltd.
CSR Policy Carnation Developers Pvt. Ltd.